A recent market study published by the company “Clinical Chemistry Market: Global Industry Analysis 2013-2017 and Forecast 2018-2026” consists of a comprehensive assessment of the most important market dynamics. Upon conducting thorough research on the historic as well as current growth parameters of the clinical chemistry market, the growth prospects of the market have been obtained with maximum precision. The report features the unique and salient factors that will have a significant impact on the development of the clinical chemistry market during the forecast period. The report will also help market players to modify their manufacturing and marketing strategies to envisage maximum growth in the clinical chemistry market in the upcoming years. The report provides detailed information about the current and future growth prospects of the clinical chemistry market in a comprehensive manner for the better understanding of the readers. The report commences with an executive summary of the clinical chemistry market report, which includes a summary of the key findings and key statistics of the market. It also includes the market value (US$ million) estimates of the leading segments of the clinical chemistry market and the wheel of fortune. Market introduction comprises detailed market definitions by product type. Readers can find detailed taxonomy and the definitions associated with the clinical chemistry market in this chapter, which will help them gather the basic information about the clinical chemistry market. The Inclusions and exclusion criteria with the assessment of the parent market of the clinical chemistry market have also been mentioned in this section. This chapter focuses on the several macro-economic factors that are responsible for fluctuations in the growth of the clinical chemistry market. The opportunity analysis of the various segments of the clinical chemistry has also been presented in this section. This section provides insights on the feature comparison and brand share analysis by major products for clinical chemistry analysers, pricing analysis and regulatory scenario. This section contains major indices for the clinical chemistry market. Some of them include the clinical chemistry market evolution, drivers, restraints and trends. This chapter includes a detailed analysis of the growth of the North America clinical chemistry market, along with the country-wise assessment for the U.S. and Canada. Readers can also find information about the regional market growth based on the product type, end user and countries in the North America region. Readers can find detailed information about factors, such as the key regulations and regional trends that are impacting the growth of the Latin America market. This chapter also discusses the growth prospects for the clinical chemistry market in the leading LATAM countries such as Brazil, Mexico and the rest of the Latin America region. The growth prospects of the clinical chemistry market are based on product types and end users in several European countries, such as the UK, France, Italy, Spain, Russia, Germany and the rest of Europe, have been included in this chapter. The country-wise market size and market attractiveness index has also been included in this section. Japan, China, India, ASEAN and Australia are the leading countries in the APAC region, which are the prime subjects of assessment to obtain the growth prospects of the APAC clinical chemistry market in this chapter. The section also includes data for the rest of the APAC region. Readers can find thorough information about the growth parameters in the APAC clinical chemistry market for the period 2013–2026. This chapter provides information about how the market will grow in the major countries of MEA region, such as Saudi Arabia, South Africa and the rest of the Middle East and Africa, during the period 2013–2026. This chapter provides several forecast factors considered in the clinical chemistry market report. The region-wise relevance and impact of these forecast factors on the clinical chemistry market is also mentioned in this section. This section covers all the major forecast assumptions taken into consideration for market analysis of clinical chemistry. The market structure analysis section covers the market structure based on the tier of companies and a company share analysis for the major manufacturers in the clinical chemistry market for 2017. In this chapter, readers can find a comprehensive list of all the leading stakeholders in the clinical chemistry market, along with detailed information about each company, which includes the company overview, revenue shares, strategic overview and recent company developments. Some of the market players featured in the report include Siemens AG, Abbott, Thermo Fischer Scientific, Danaher, F. Hoffmann-La Roche Ltd., bioMérieux SA, Bio-Rad Laboratories Inc., Cardinal Health, Inc., Mindray Medical International Limited and Hitachi, Ltd.
By region, the clinical chemistry market is segregated into 7 major regions, namely North America, Latin America, Europe, Asia Pacific and the Middle East and Africa. In this chapter, readers can find information about the key trends and developments in the clinical chemistry market and the market attractive analysis for individual regions pertaining to the product type and end user segments of the clinical chemistry market. The product type segment of the clinical chemistry market is segmented into clinical chemistry analysers, POC test kits and clinical chemistry analyser kits & reagents. The clinical chemistry analysers segment is sub-segmented into semi-automated clinical chemistry analysers and automated clinical chemistry analysers. By POC test kits, the clinical chemistry market is sub-segmented into test strips, cassettes and dipsticks. Based on End User, the market is segmented into hospitals, pathology laboratories, maternity centres and outpatient centres & clinics. In this chapter, readers can find information about the key trends and developments in the clinical chemistry market and the market attractive analysis based on end user. This section focuses on the global market value analysis by segment. It also provides the absolute $ opportunity for the global clinical chemistry market. This chapter will helps readers understand the research methodology followed to obtain various conclusions and important qualitative & quantitative information about the clinical chemistry market. Several major changes in the clinical chemistry market have been brought about as a result of the convergence of system automation, engineering and IT technology. Technological advancements in the clinical chemistry market have created numerous opportunities for various new reagents, instruments, calibrators and several other related clinical chemistry products. For instance, the StaRRsed Inversa automated Erythrocyte Sedimentation Rate (ESR) analyzer helps lower the possibility of the manual errors that occur during any clinical chemistry analytical procedure. In January 2017, Roche launched cobas m 511, an integrated haematology analyzer. This analyzer combines the three components of the process: a cell counter, digital morphology analyzer and classifier, into 1 streamlined solution that helps prepare, analyze and stain microscopy blood slides. Constant developments in clinical chemistry devices have resulted in enhancing the product portfolio of manufacturers as well as improving the efficacy of test results. Advancements in the expansion of clinical chemistry testing menus & instrument capabilities, immunoassay instruments and reagent adaptables to core laboratory workstations is also projected to contribute to the growth of the clinical chemistry market over the forecast period. In the present scenario, healthcare settings, majorly hospitals, are significantly inclined towards owning fully-automated clinical chemistry systems that have built-in quality-assurance capabilities. These clinical chemistry systems possess the ability to process a larger number of samples at a time. For instance, these fully-automated clinical chemistry systems are capable of performing functions such as tube sampling, the recognition of a sample & reagent bottles, cap piercing, dilution and automatic re-run. There is also an increase in the number of government initiatives that aim at promoting better healthcare diagnostic facilities to provide quicker results, which has further contributed to the shift toward these automated devices. This shift is one of the major factors contributing to the growth of clinical chemistry market. Point of care testing is important for the rapid detection of the analytes close to the patient for better diagnosis, management and monitoring. It enables the detection of diseases at an early stage. A wide range of point-of-care assays for the quantitative determination of biomarkers is being developed with the use of easy-to-use and portable POC biochemical and clinical analyzers. Lifestyle-related diseases, such as cardiovascular diseases, have been a global threat and are majorly responsible for the high mortality rates worldwide. Lifestyle diseases, such as diabetes mellitus, hypertension, overweight/obesity and dyslipidaemia, are among the major risk factors that can lead to the development of cardiovascular diseases. According to the National Center for Biotechnology Information, cardiovascular diseases are considered to be a major cause of mortality, which represents approximately 30% of all the deaths worldwide. The role of laboratory-based physicians or clinical pathologists is consistently being challenged on various fronts, such as, increasing the patient autonomy exercised for direct testing, exponential advancements in clinical chemistry technology and the usage of non-medical specialists as substitutes. The lack of skilled professionals for various clinical chemistry processes is likely to hamper the growth of the clinical chemistry market during the forecast period. For instance, countries in the SADC, which is the Southern Africa Development Community, are facing a severe scarcity of laboratory pathologists. The number of pathologists in this region for the examination of samples or interpretation of clinical chemistry laboratory tests for ensuring proper patient treatment is low, which is likely to affect disease diagnosis and the treatment of various diseases in the region. 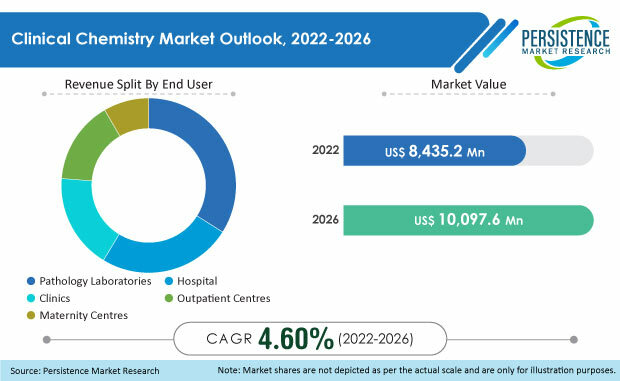 The competition section of the clinical chemistry market report features the profiles of the key players operating in the clinical chemistry market based on their differential strategies, market shares, product offerings, company dashboard and marketing approach. Examples of some of the key players operating in the clinical chemistry market are Siemens AG, Abbott, Thermo Fischer Scientific, Danaher, F. Hoffmann-La Roche Ltd., bioMérieux SA, Bio-Rad Laboratories Inc., Cardinal Health, Inc., Mindray Medical International Limited and Hitachi, Ltd.
Clinical chemistry utilises chemical processes for measuring certain levels of chemical components in an individual’s body fluid. The common specimens that are tested in clinical chemistry are urine, blood and cerebrospinal fluid. There are various clinical chemistry tests that exist to test these chemical components in the urine or blood, which include electrolytes, blood glucose, hormones, enzymes, proteins, lipids (fats) and other metabolic substances. PMR conducted a research study on the clinical chemistry market for the forecast period 2017 to 2026. The clinical chemistry report offers a comprehensive evaluation of the business opportunities prevailing in the clinical chemistry market, along with insights on the clinical chemistry market evolution, market trends, product feature comparison, the brand share analysis of the clinical chemistry analysers, pricing analysis based on product type and clinical chemistry market competition. The report elaborates the macro-economic factors influencing the dynamics of the market and its futuristic potential. The report offers a comprehensive taxonomy of the clinical chemistry market based on the product type, end users and region. The clinical chemistry market by product type is segmented into clinical chemistry analysers, POC test kits and clinical chemistry analyser kits & reagents. The clinical chemistry analysers are further sub-segmented into semi-automated clinical chemistry analysers and automated clinical chemistry analysers. By POC test kits, the clinical chemistry market is sub-segmented into test strips, cassettes and dipsticks. The end user segment of the clinical chemistry is segmented into hospitals, pathology laboratories, maternity centres, outpatient centres and clinics. The clinical chemistry market has been analysed across all the regions of North America, Latin America, Europe, Asia-Pacific and the Middle East & Africa. What is the revenue potential of the clinical chemistry market across the regions of North America and Europe? Who are the key competitors and what are their portfolios in the clinical chemistry market? What are the major challenges influencing the growth of the clinical chemistry market? How is the intervention of regulatory authorities shaping the growth of the clinical chemistry market?